Just like the other neighbouring Turkic peoples, the Karakalpaks used a variety of bags and containers to store their provisions and possessions inside the yurt. The face of a Karakalpak tay tuyaq qarshın storage bag. Woven in Qarao'zek in the early 20th century. The Richardson Collection. Most bags and containers were located on the women's side of the yurt, known as the sol jaq or shep jaq, the left side (sometimes called the qazanayaq, the side where the cauldron is kept) as seen by someone sitting in the to'r, the central place of honour, looking towards the door. Large sacks of provisions such as grain stood on the floor, bags and pumpkins with flour and salt hung from the kerege lattice wall, along with a digirman or food mill, cauldron or qazan and cold water in a copper ewer or jug (mıs qumg'an). Just to the right of the to'r, on the men's side or on' jaq (meaning right side), stood the main item of furniture. This was traditionally a locally made sandıq or cupboard, used to store light clothing with the tea dishes kept in one of its compartments. Alternatively there could be a sabayaq, a wooden stand open at the sides and back and typical for the women's side of the yurt. Less traditional was an arsha (a Russian-style metal trunk). Whatever the object, it was generally topped by a qarshın, a long rectangular bag used for storing clothing, wool, and other soft items. On top of the qarshın sat the pile of bedding, the ju'k, consisting of dastıq or long pillows, blankets, and ko'rpe or cotton quilted bedding. A Karakalpak qarshın storage bag located on top of the sandıq. Photographed in Kegeyli region in 1954. From Works of the Khorezm Expedition, Volume 3, 1958. Following the nationalization of the land in 1929, agricultural collectivization led to the grouping of small awıls into kolxozes. Work began on constructing settlements with streets of clay houses and yards. By 1950 smaller kolxozes were being merged into larger units and the remaining traditional awıls began to disappear as new settlements were constructed on a grid basis, centred around facilities such as a school, small clinic, social club and reading room, or farm store. Houses were still single storey and had clay walls, but were bigger than traditional tams, had higher walls, wooden floors, and some form of heating. They also had a kitchen or asxana so cooking utensils and provisions were no longer kept in the yurt. Factory furniture such as nickel-plated beds and storage cabinets became increasingly available. Some storage bags became redundant. However yurts were maintained as sleeping quarters for the hot summer nights and sandıqs and qarshıns were preserved, only falling into disuse in the 1960s as the popularity of the yurt declined. Readers will note that we have used the word qarshın to describe these bags. Because most of the literature on Karakalpak material culture is in Russian, most English authors have adopted the incorrect description karshin, which is actually a transliteration of the Russian word каршын, spelt with the normal Cyrillic k.
The Russian Cyrillic alphabet was imposed upon the Karakalpaks in 1940 as a means of uniting the peoples of the USSR and of promoting the teaching of Russian. Certain additional letters were included to cope with certain Karakalpak phonetics. Even so Cyrillic has never been really appropriate for many Karakalpak words. We have attempted to use the correct English transliteration for all of the Karakalpak words used on this page. For further details, see Karakalpak Glossary and Karakalpak Language. Long box-shaped storage bags designed to sit on top of the sandıq are not unique to the Karakalpaks. Qarshın-like bags are found among the Uzbeks from the Samarkand region and from Afghanistan (where they are known as napramach), the Uzbek-Turkmen of Nurata (qarchin), the Uzbek-Lakai (mapramach), the Qazaqs (ten-tyuk and shabadan), and the southern Kyrgyz (either chavadan or napramach, and in the case of the Kesek tribe, naprach). A Qazaq ten-tyuk from the Qizil Orda region of the lower Syr Darya. 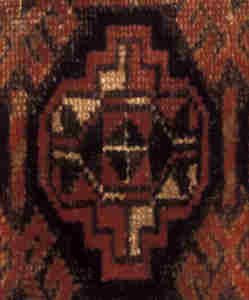 Similar bags were woven by Qazaqs in the Aral Delta. They are also used by a few of the Turkic nomadic tribes who live in Iran, the Transcaucasus, and Anatolia, such as the Shahsavan and the Qashga'i (who both use the Arabic word mafrash). However they are not as a rule used by the Turkmen. Although many Turkmen tribes, especially the Transcaspian Turkmen (the Yomut, Goklen, Igdir and Chodor), wove a bag called a mafrach, this was not box-shaped but was a flat two-sided bag with the same proportions as a chuval, although somewhat smaller. The one exception among the Turkmen seems to be some of the tribes living in Iran who used a storage bag called a qarchin, which was positioned below the pile of bedding just like the Karakalpak qarshın. It had a decorated pile face and was laced along one side, being laid flat with the laced up edge facing the interior of the yurt to facilitate easy access. Not all of these box-shaped bags are made in the same way. 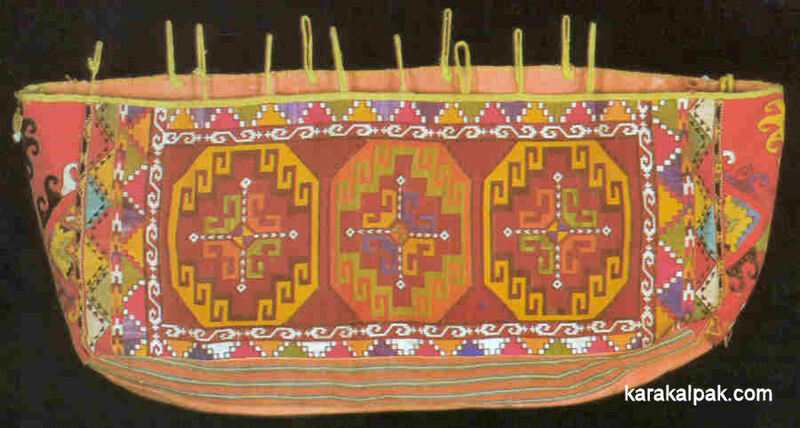 The Qazaqs (including those from the Aral Delta) and the northern Kyrgyz generally made their shabadans and chavadans from felt, decorating them with felt appliqué or with corded patterns. When Falk and Bardanes visited the Khan of the Qazaq Middle Horde in 1771 they observed that he used a leather bag to store the clothing on top of a small box. The Shahsavan on the other hand wove the front, sides, and back using the soumak (weft-wrapping) technique. However the Karakalpaks always make them with a woollen all-pile face and a flat-weave bottom, back, and sides. Uzbek napramach and southern Kyrgyz chavadans were made in a similar way. Qazaq ten-tyuk were made with either all-pile or felt faces � the name means "equal or identical packages" since they were designed to be carried by camel, one on each side. 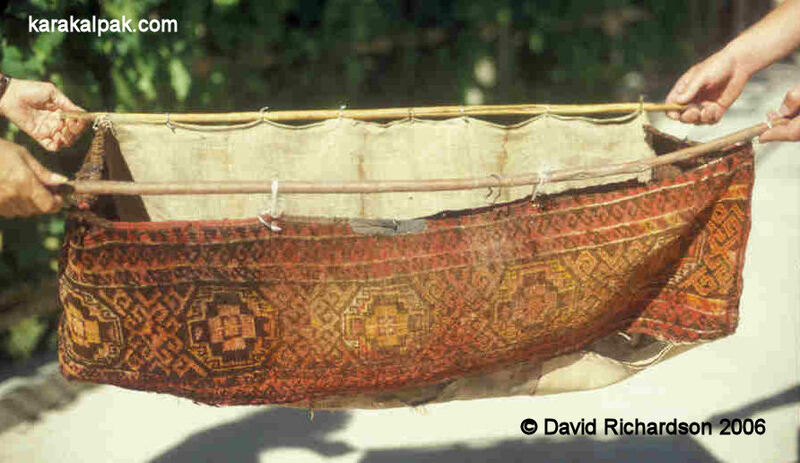 Interestingly many of the Uzbek and Qazaq qarshın-like bags with piled carpet faces seem to be made using the same symmetrical knotting technique, although most southern Kyrgyz chavadans seem to have asymmetric knotting. These bags are always used for the storage of bedding or clothing. 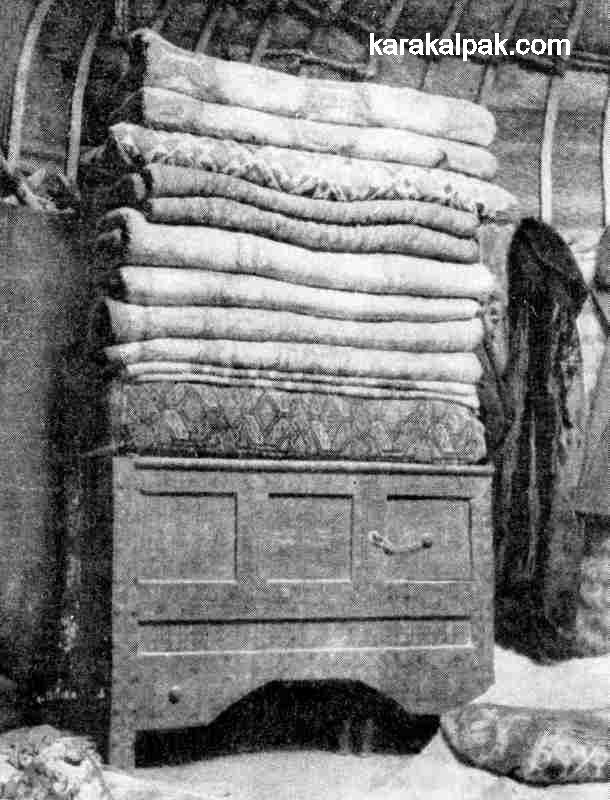 In the case of the Karakalpaks during the 20th century the use always seems to have been for the best items of clothing, the bedding being folded and stored in a pile above the qarshın. The Karakalpak qarshın is roughly 110cm long, 30cm wide and 30cm tall � similar to the dimensions of the Qazaq ten-tyuk but generally longer and thinner than most other Uzbek, Qazaq, or Kyrgyz storage bags. However there is considerable variation. Bag faces range in length from 90 to 130cm, and in width from 25 to 36cm. Some can be very long and thin, while a minority are short and wide. Shahsavan and Qarabagh mafrash were usually woven as a single entity, using one set of warps. The two end panels were then cut off and sewn into the ends of the bag. A complete Qarabagh mafrash after being removed from the loom. The mafrash has been woven on a single set of warps. By contrast not one of the Karakalpak qarshıns that we have examined was woven as a single entity. The front face, the bottom, and the sides and back were always woven separately and were then sewn together using a thread of spun and plied goat hair. Clearly the narrowness of the Karakalpak loom made it impossible to make a completely integral bag, although it would have been possible to make the face, sides, and back as an integral piece. So that the bag could be fastened at the top, small loops were sewn to the top edges of the front and back sections. One or two sticks could be slid through the two sets of loops, supporting the bag and allowing it to be fastened for transportation. A complete qarshın storage bag from Bozataw. Today it is quite unusual to see a complete bag. Usually they have deteriorated into such a bad condition that the back, sides, and bottom have been removed, leaving just the decorative all-pile face � the qarshın aldı. A complete qarshın bag made from an esikqas. Item 5111-138 from the collection of the Russian Ethnography Museum. Qarshıns were part of the marriage dowry and were traditionally woven by the young bride in her native village during the period following the wedding ceremony while she still lived with her parents � see Karakalpak Marriage. The structure and designs that she used were influenced by her mother, elder sisters, or female relatives and neighbours, in other words by the culture of her village and clan, not by the culture of the village or clan of her husband. All of the components of the Karakalpak qarshın were woven on the ubiquitous o'rmek loom, as were the tent bands and other decorations required for the married couples new yurt or otaw. Karakalpak qarshıns have a uniform and simple structure. They are always woven on hand-spun goat hair warps with a two-ply structure (always z2s). Warps will occasionally include mixed threads with one yarn of goat hair plied with one yarn of lighter coloured sheep's wool, producing a barber's pole effect. However with one or two exceptions, goat hair always predominates in the warps. Note however that there are two types of goat fibre. The fibres used for the warp are generally always dark brown and are long and shiny � longer and stronger than sheep or camel wool fibres. Karakalpaks call this goat hair qılshıq. Under high magnification it appears very straight and glossy � almost like fibres of glass - and has none of the crimp (frizzyness) found in sheep or camel wools. There is a softer goat's wool called tu'bit, which comes from the neck and underbelly of the goat, but this is not suitable for knotted carpetmaking. For the flat plain-weave sections of the qarshın the goat hair warps are combined with a weft of more goat hair or of sheep's wool (both z2s). The use of sheep's wool is usually associated with the inclusion of weft stripes, light coloured sheep's wool being combined with goat hair to produce ivory and brown stripes, or sheep's wool of various colours being used alternatively to produce coloured weft stripes. As regards the all-pile face, the weaving always starts and finishes with a section of flat plain-weave. However the knotted section is always woven with a weft of lightly plied (z2s) camel wool, coloured either ginger, golden brown, or beige. Usually only one shoot of weft has been used between each row of knots, but sometimes one encounters two. The pile is always made from hand-spun sheep's wool (again z2s), usually dyed but sometimes just naturally coloured. The colour palette of the woollen pile varies enormously. The older 19th century qarshıns combine rich dark browns with purple or sometimes mauve, rust red, white, and indigo blue. Indeed the extensive use of indigo seems to be a feature of the earlier Karakalpak qarshıns. As we enter the 20th century we see an increasing use of chemical dyes, especially red and orange along with new colours such as yellow, grey, and even green. At the same time the use of indigo becomes increasingly rare, possibly due to Russian efforts in obstructing the import of commodities from Afghanistan and India. Occasionally one finds small amounts of white cotton or pink or purple coloured silk included in small sections of the pile face to create jewel-like highlights. This is less common in weavings made after the 1917 Revolution. The knot is almost invariably symmetrical. Knot density varies widely from an almost crude 1,200 knots per dm² found in one or two examples to a very fine 2,800 to 2,900 knots per dm² found in a few others. However the knot density of most qarshıns falls within the 2,000 to 2,400 range. 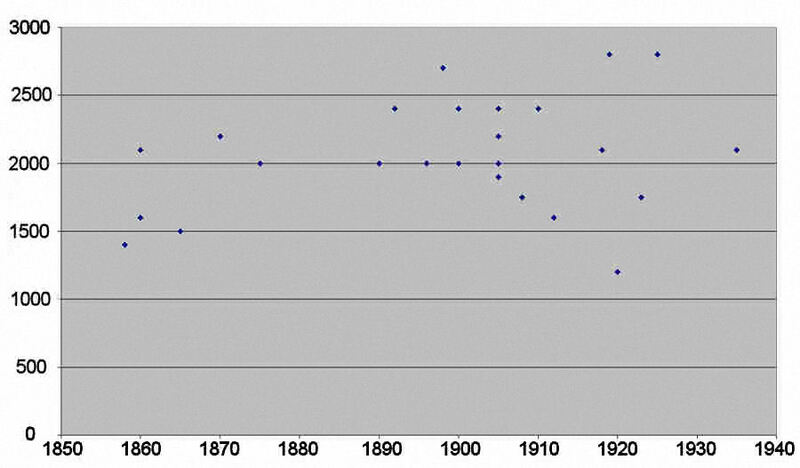 Our own observation of knot density in qarshıns of varying ages suggests that the distribution of knot density remained fairly constant between the mid-19th century and the 1930s. Throughout this period there were always some weavers producing high quality qarshıns and other weavers producing qarshıns with lower knot densities. This is well illustrated by the small collection of 27 qarshıns held at the State Museum of Oriental Art in Moscow, all of which were obtained from the Kegeyli region in 1958. Unlike the Karakalpak collections in most museums, the majority of these qarshıns have some provenance, many with records identifying the weaver and the weaver's clan as well as the year or decade of manufacture. After joining the museum, Ludmilla Beresneva was given a small project to analyse this collection and to record the structure and knot density of every item. The scatter diagram of knot density against age suggests an improvement rather than a decline in weave quality, although the sample size is small. from the State Museum of Oriental Art, Moscow. "We assume that white cotton yarn was used for strengthening the warp but time has destroyed it and now we can only see small white specks, almost invisible amongst the dark brown threads, which remain in good condition." We have not so far seen any evidence of cotton being used in the warps or wefts of qarshıns that we have examined ourselves. Certainly some of the Khorezmian Turkmen tribes such as the Igdir plied their camel wool wefts with cotton, although they did not include cotton in their goat hair or mixed goat hair and sheep's wool warps. Indeed it is difficult to comprehend why a weaver would need to include cotton in such a strong warp made from plied goat hair. At the same time it is a mystery to understand why the cotton in such articles, if it ever existed, should have decomposed so badly when all-cotton Karakalpak tent bands from the same era remain in good condition. In our experience Karakalpak carpet items are not particularly well looked after and can be very dirty. One possible explanation is that the white fragments observed by Beresneva were not decomposed particles of cotton but just specks of dirt. These are easily seen under high magnification in the majority of Karakalpak carpet items. There is no consistency in the structure of qarshın side finishes. The sides can be constructed from two, three, or four cords, each normally formed around two warp threads. The warps are invariably wrapped with sheep's wool (z2s), which is usually dyed either dark brown, red, or salmon pink and occasionally light brown. The most common side wrapping is plain red or plain brown, but one frequently encounters alternating sections of red and brown, and sometimes sections of beige and other colours as well. A small minority of qarshıns have only a narrow selvedge of flat plain weave, with the weft interlaced with up to six warps on each side. One does very occasionally encounter qarshıns, which by design appear Karakalpak but do not have a traditional Karakalpak structure. For example, a very small number have an asymmetric knot while others have an all sheep's wool warp. One qarshın nag'ıs qarshın from Taxta Ko'pir has a typical Karakalpak structure apart from being woven on warps with a pronounced displacement, more suitable for a main carpet than a small bag. In the absence of detailed records these cases are hard to explain. It is possible that some were woven by Turkmen women married to Karakalpak men, who maintained their traditional Turkmen weaving structures despite weaving Karakalpak patterns. There are just four main types of Karakalpak qarshın, each with its own distinct pattern or decoration (nag'ıs). In addition there are a few rare patterns, some of which may have become extinct during the first quarter of the 20th century. Each type is quite different, bearing no resemblance to the others apart from the fact that all but one of them has a primary motif which is octagonal. Igor Savitsky was the first to realize that qarshıns generally incorporated an octagonal nag'ıs. The one exception is the Shu'yit qarshın, which incorporates a 24-sided chuval-like motif. Confusion between the patterns of qarshıns and esikqas remains a constant problem, and most publications up to the present day continue to confuse the two. This problem is not helped by the fact that most village people today no longer understand the difference between qarshıns and esikqas. Qarshıns are often found that have been used as a esikqas and some still have ishki janbaw attached to them. At the same time one also encounters esikqas used as qarshın bag faces, the most famous example being the complete qarshın bag at the Russian Ethnography Museum in St Petersburg (inventory number 5111-138, shown above). In many instances this is merely a reflection of the collapse of Karakalpak culture over the past sixty years. However examples of this confusion can be found in the earliest publications of the Khorezmian Archaeological-Ethnographic Expedition, suggesting that the mix-up between qarshıns and esikqas was already prevalent in the late 1940s. Members of that Expedition attempted to find women weaving piled carpets or combination technique tent bands incorporating piled work during their 1952 to 1954 research programme but failed to do so. It seems that by 1950 the craft of pile weaving had already been lost. Qarshıns with the tay tuyaq (foal's foot) motif are in our experience the most common type, accounting for at least 40% of all qarshın designs. The name tay tuyaq is quite a good description as the octagonal motif appears to contain the outline of the hoof print of a horse. We have occasionally heard these qarshıns referred to as elephant track (said to imply a link with the Kushans, a ridiculous assertion), or even camel track pattern. A tay tuyaq qarshın from Sverdlova sovxoz in Qon'ırat region. Item number 4410 from the Savitsky State Museum of Art, No'kis. 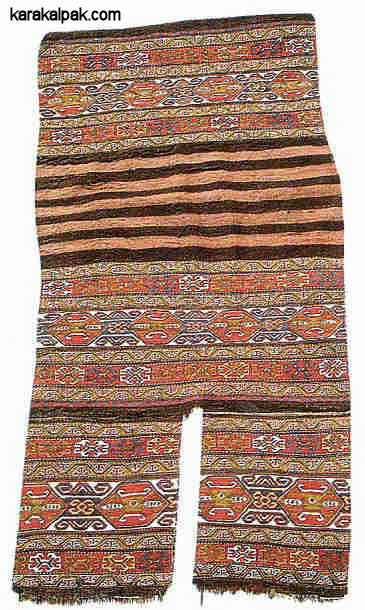 The tay tuyaq pattern is typical of the Qon'ırat Karakalpaks. Despite its popularity it is hard to track down examples with a detailed provenance � many museum examples have no record of the weaver or her clan or village location. From the information that we have gathered so far, the majority of examples come from the northern delta: from Moynaq, Shege, Qon'ırat, Qarao'zek, and Taxta Ko'pir. However a significant number are also found in the Kegeyli region further south. The general impression is that the majority of tay tuyaq qarshıns have been woven by women belonging to the Qon'ırat arıs although non-Qon'ırat examples can be found, such as those woven by the Qıpshaq tribe (On To'rt Urıw). One must also remember that a southern location does not always imply a non-Qon'ırat origin since many Jawıng'ır settled in the region surrounding Shomanay. For example we located one example with good provenance in a Shu'yit clan family near Kegeyli, but following closer questioning we discovered that it had been woven by a grandmother who was from the Baymaqlı clan (Jawıng'ır tribe of the Qon'ırat). Unlike the other three qarshın types we will examine below, tay tuyaq qarshıns have maintained a stable design for perhaps a century or more. Examples from the second half of the 19th century and one or two that may date from the first half are remarkably similar to examples dating from the 1930s. A fragment of an early tay tuyaq qarshın, possibly from the first half of the 19th century. Item number 2459 from the Savitsky State Museum of Art, No'kis. 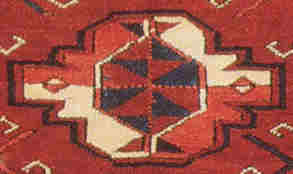 In the tay tuyaq qarshın the primary motif consists of a brown octagon with a coloured external outline that is either red, white, or blue, or an alternating mix of the same colours, such as red and blue. The octagon is segmented internally into quadrants by narrow brown horizontal and vertical lines in the form of a cross. However the vertical line is not usually complete, often terminating before reaching the centre and the edge of the octagon. The quadrants so formed are coloured alternately with red and white backgrounds. There is no standardized orientation � for example if the qarshın is viewed as it would appear on top of the sandıq, then the first quadrant in the noon to 3 o'clock position can be either red or white. 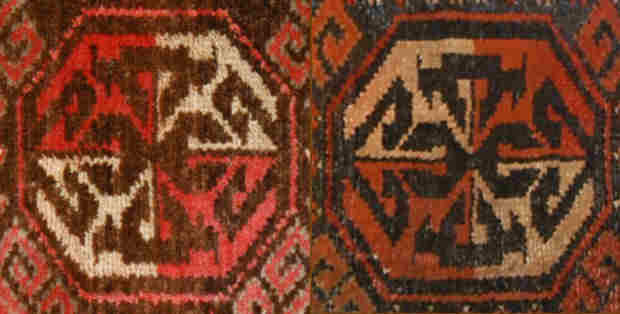 Two different tay tuyaq motifs with opposite diagonal colour arrangements. Each quadrant contains three angular brown figures that appear to be more than just geometric shapes and possibly have an anthropomorphic origin. One is rather eagle-like, with a feather projecting behind the head. Similar figures appear in certain Turkmen guls, such as the Arabachi, Chodor, and Yomut tauk nauska, which Robert Pinner believed to be a representation of the mythical Great Bird. Whether he was right or wrong we do know that in the past many Turkmen tribes had their own individual bird totem, while the Karakalpaks held birds such as the sea eagle, eagle owl, and crow in great esteem. A second figure could be interpreted in several ways: either as the head of a goose-like bird with an arched back neck or as a half of a pair of horns. The set of figures in any one quadrant appear in the form of a mirror image in the adjacent quadrants. Consequently this reflected symmetry is maintained whether the motif is divided in two horizontally or vertically, the figures on one side of the motif being the mirror image of those on the other side. Of course the one exception is the background colouring, which maintains only diagonal not reflected symmetry. Three different 19th century Turkmen chuval guls, two Yomut and one Tekke. Two 19th century octagonal chuval-like guls, Emreli on the left and Yomut on the right. 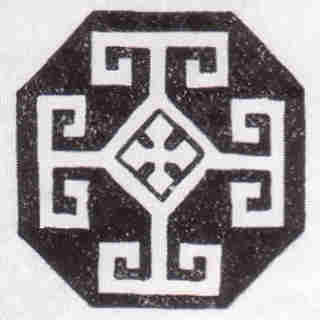 This raises the question as to whether the tay tuyaq motif has an archaic origin, bearing some relationship to some as yet unknown precursor to the chuval gul, or whether it evolved much later through a process of simplification, from either the chuval gul itself or from an octagonal equivalent. One important observation is that on the face of the bag, the Karakalpak tay tuyaq motif has a different orientation to the Turkmen chuval gul. Of course in the Karakalpak qarshın the warps have a horizontal orientation, whereas in the Turkmen chuval the warps have a vertical orientation. Consequently both motifs have the same orientation relative to the warps. The different orientations of the tay tuyaq and chuval motifs. The primary octagonal tay tuyaq motif is mostly associated with a secondary segiz mu'yiz or eight-horned motif centred around a diamond divided into quadrants (often referred to as a gochak g-l in Turkmen weaving). In a few rare examples the secondary motif is an on eki mu'yiz or twelve-horned motif. The secondary segiz mu'yiz motif. The most common layout is based on a field with a double row of octagons. The segiz mu'yiz motifs are arranged diagonally in between. A qarshın normally contains 14 or 16 octagonal motifs, and occasionally 12 or 18. Sometimes the field terminates with incomplete motifs. 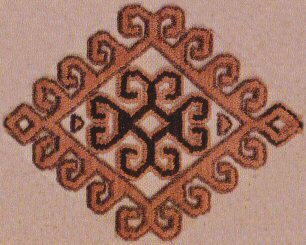 Tay tuyaq motifs tend to be separated from each other, both horizontally and vertically, by a short row of two, three, or four diamonds. There is a much less common tay tuyaq qarshın in which there are three rows of octagonal motifs, arranged as a diagonal lattice with the shorter middle row aligned diagonally against the outer rows. The diagonal colour symmetry of the middle row differs from that of the outer rows. Sometimes the outer colouring of the middle row octagons can also be different. 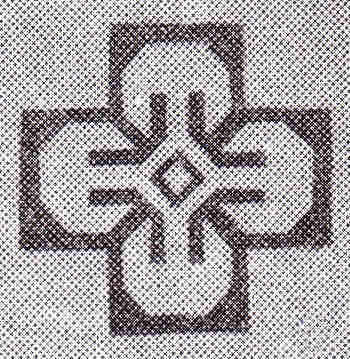 The secondary segiz mu'yiz motifs are similarly positioned diagonally in between the tay tuyaq motifs. In this pattern one frequently sees the segiz mu'yiz motif replaced with a simpler four-horned diamond, known as Xorasanı mu'yiz (meaning the horns of livestock from Xorasan). Note that the Karakalpaks never use the term "four horns". 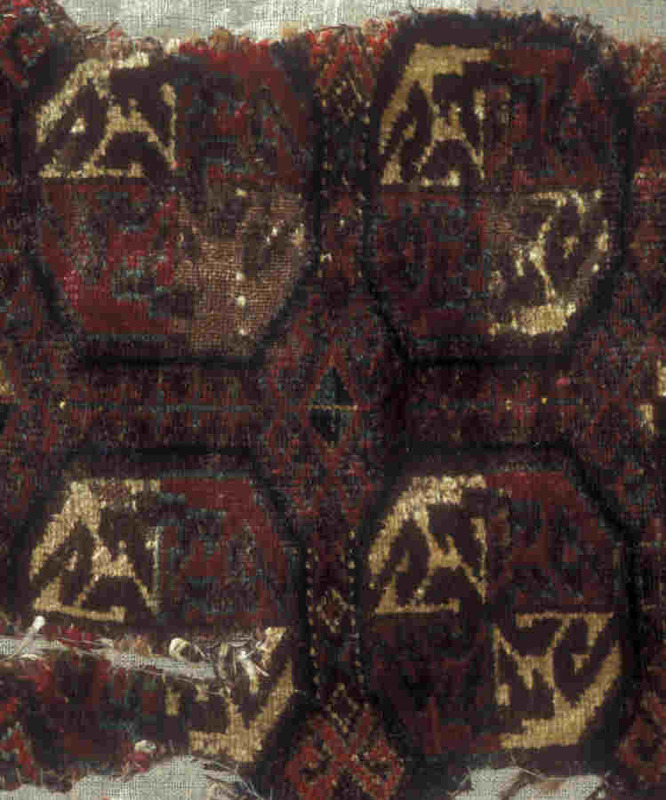 A late 19th century tay tuyaq qarshın with three rows of motifs and a secondary Xorasanı mu'yiz motif. Item 7128-13 from the collection of the Russian Ethnography Museum. The piskekshe border pattern consists of a row of square-shaped motifs, each composed of five smaller squares. 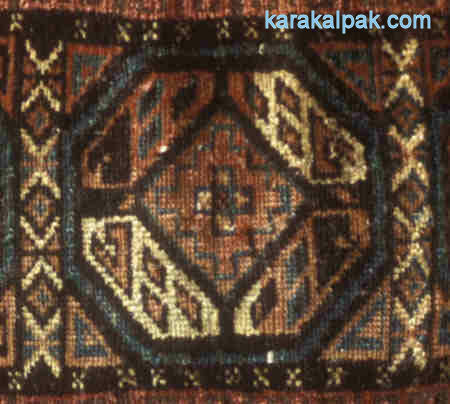 Karakalpaks liken this motif to the crossed-shape of a beater that fits inside a butter churn or piskek. Less common borders are pairs of horns, or qos mu'yiz, and the teeth of a saw, or jarg'ı tis. A few examples (such as 4410 above) have no side border decorations at all. The so-called qarshın nag'ıs is the second most common qarshın pattern, accounting for over 30% of all qarshıns. In the late 1930s and the 1940s Tatyana Zhdanko's ethnographic team found this pattern in more than half of all the qarshıns that they encountered, although they only identified three types of qarshın pattern (qarshın, tay tuyaq, and Shu'yit nag'ıs), mistaking the tikesh pattern for a esikqas. From our own observations in the field and from the content of known museum collections, we believe that the tay tuyaq pattern is actually more common than the qarshın nag'ıs. 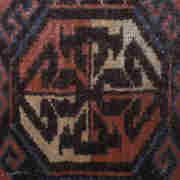 A qarshın nag'ıs qarshın woven in Taxta Ko'pir by Immagu'lsim in the 1920s. She belonged to the Mu'yten-Teli clan. The Richardson Collection. Just like the tay tuyaq qarshın, qarshın nag'ıs qarshıns are mainly associated with the Qon'ırat Karakalpaks although examples woven by On To'rt Urıw Karakalpaks can also be found. For example, out of the five examples in the Moscow collection where the clan of the weaver was known, four were woven by women from the On To'rt Urıw arıs. Of course the Moscow examples are all from the Kegeyli region where On To'rt Urıw clans are in the majority. In general however, qarshın nag'ıs qarshıns are most commonly found in the northern part of the delta in villages such as Moynaq, Taxta Ko'pir, and Qanlıko'l. 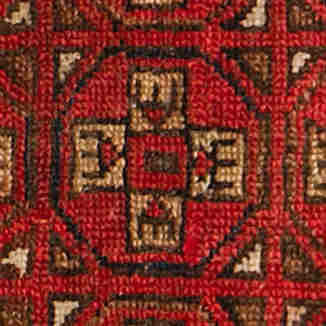 The octagonal qarshın nag'ıs motif has a triple outline, the outer and inner elements of which are brown, the middle element being coloured. This colour tends to be blue in the older qarshıns and red in the later qarshıns but can also be white or even yellow. At the centre of the octagon is a large diamond with a red background. Inside this diamond is a stepped diamond and inside the stepped diamond are five small squares arranged in the form of a cross. Lines projecting from each corner of the central diamond divide the outer sections of the octagon into quadrants. These quadrants are coloured alternatively red and white, creating diagonal colour symmetry. Each quadrant contains an angular figure and three small parallelograms, arranged so that the figures within each quadrant appear as the mirror image of the figures in the neighbouring quadrant. Ludmilla Beresneva has suggested that these figures may be the simplified remnants in geometric form of animals or birds that were once tribal totemic symbols. The qarshın nag'ıs from a qarshın woven in Moynaq around 1905. In the older examples the colour of the central diamond and two of the quadrants is not red, but reddish brown or purple. These examples tend to include extensive indigo detailing. A late 19th century Uzbek napramach with three octagonal motifs. One or two of the patterns found in Uzbek napramach are actually closer to the less common Karakalpak octagonal motifs � see "Other Octagonal nag'ıs qarshıns". 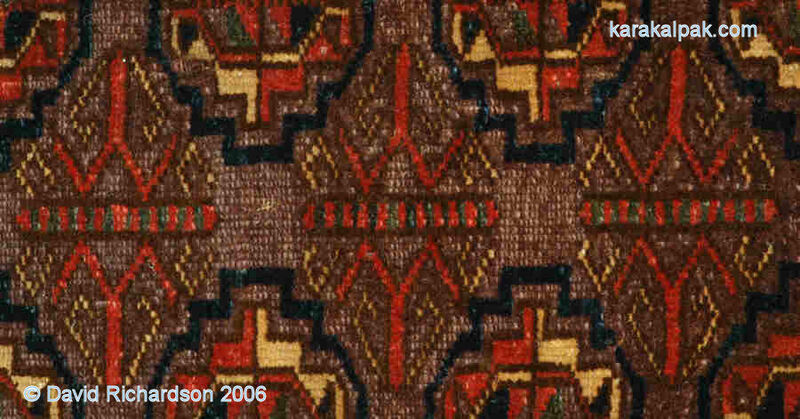 Beresneva pointed to some similarities with the octagonal kalkan nuska gul found in Uzbek-Turkmen carpets from the Jizzax region of Uzbekistan, to the east of the Nurata mountains. Both are octagonal, have a geometric figure in the centre, are segmented into quadrants, have diagonal colouring, and contain anthropomorphic figures. Visually however the two motifs are quite different. In many ways the kalkan nuska gul is much closer to the Saryk Temirchin gul or the Ersari gulli-gul. In the qarshın nag'ıs pattern the primary octagonal motif is relatively large and only ever appears in a single row without the presence of a similar sized secondary motif. There are from four to seven octagonal motifs in each qarshın. There are two basic variants of the qarshın nag'ıs pattern. In the first and possibly the most traditional, the qarshın motifs are framed within squares and are separated from each other by a vertical bar containing smaller motifs, such as diamonds, segiz mu'yiz, or Xorasanı mu'yiz. There is usually just one border along each side, the most common containing alternating diamond and I-shaped motifs. The first variant of the qarshın nag'ıs pattern has the octagonal motifs placed in square frames. In the second variant, more typical of the 20th century, the motifs are separated by a pair of triangles containing curled ram's horns and a vertical row of three small diamonds, the two outermost positioned near the apex of each triangle. There are usually two side borders, such as qos mu'yiz and piskekshe, and sometimes even three. Alternatively there may be one wide border with alternating diamond and I-shaped motifs or horn motifs. The second variant of the qarshın nag'ıs pattern has pairs of triangles separating the octagonal motifs. Both of these variants are found across the same geographical areas - the Moynaq, Taxta Ko'pir, Qanlıko'l and Kegeyli regions. There is not enough information to indicate any tribal association for the two variants � for example between the Shu'llik and the Jawıng'ır divisions of the Qon'ırat. The Shu'yit nag'ıs is named after the Shu'yit clan (Man'g'ıt tribe), who live next to the Qazayaqlı (Qıtay tribe) in villages close to Kegeyli. They formerly lived in Bekan-Shiyel awıl on the banks of the Amu Darya but moved in 1944 because of the increasing lack of water. Both clans belong to the On To'rt Urıw arıs. Although the number of Karakalpaks belonging to the Shu'yit clan is small, Shu'yit nag'ıs qarshıns are quite common, possibly accounting from 15 to 20% of all qarshın patterns. A Shu'yit nag'ıs qarshın from Moynaq, probably dating from the early 1930s. all four belonging to the Keneges-Man'g'ıt wing of the On To'rt Urıw, which also includes the Shu'yit clan. At the same time we have found Shu'yit qarshıns woven by women belonging to unrelated tribes and clans, such as the Qıpshaq. Other examples, like the one illustrated above, originate from places like Moynaq and Qon'ırat in the northern delta. Whether or not this pattern was once specifically associated with the Shu'yit clan, after which it is named, is impossible to say. However the evidence clearly indicates that the pattern is linked with certain clans living in the Kegeyli region, of which the Shu'yit are one. Over time the marriage of daughters from these specific clans to husbands from unrelated geographically separated clans has led to the spread of this pattern beyond the Kegeyli region and outside of the On To'rt Urıw arıs. The Shu'yit nag'ıs has a close resemblance to certain simple chuval guls found among some Turkmen tribes, particularly the Yomut, Saryk, Tekke, and Kizil Ayak, and also the Chodor and Igdir who refer to the motif as the sakar gul. A Turkmen origin is possible since the Kegeyli region is located close to territories that were occupied by the Yomut, Igdir, Chodor, and Emreli during the 18th, 19th, and early 20th centuries. Moshkova recorded that unlike most Turkmen tribes, the Chodor frequently married into non-Turkmen tribes such as the Qazaqs. Three different 19th century Yomut chuval guls. The different orientations of the Shu'yit nag'ıs and the Yomut chuval gul. The Shu'yit nag'ıs is based upon a 24-sided motif containing a hexagon at its centre. The outer sides of the motif tend to be outlined in three colours such as brown, red and blue or violet, red and brown. In older pieces the outlining colour can alternate, diagonally related motifs having the same coloured outlines. The internal space outside of the hexagon is divided into quadrants that are coloured alternately red and white creating diagonal colour symmetry. Each quadrant contains one or sometimes two brown triangles, which are reflected as a mirror image in the adjacent quadrants. Sometimes the central hexagon is also divided into quadrants or contains a diamond divided into quadrants. In other examples the central hexagon contains a cross with the vertical element of the cross terminating in a pair of rectangular-shaped horns. The secondary segiz mu'yiz motif in the Shu'yit nag'ıs qarshın. However some older examples contain a secondary motif that appears to be a halfway house between a Turkmen chemche gul and a Karakalpak segiz mu'yiz. This may support the theory that the pattern is not traditionally Karakalpak but has a Turkmen origin. Unable to reproduce the complexities of a Turkmen chemche gul, less experienced Karakalpak weavers opted for the somewhat similar but simpler and more familiar segiz mu'yiz. Clearly this transformation was still taking place in the later half of the 19th century. In other older examples one can also sometimes see where parts of a chemche-like gul have been interpreted as a Karakalpak g'arg'a tuyaq or crow's claw motif. 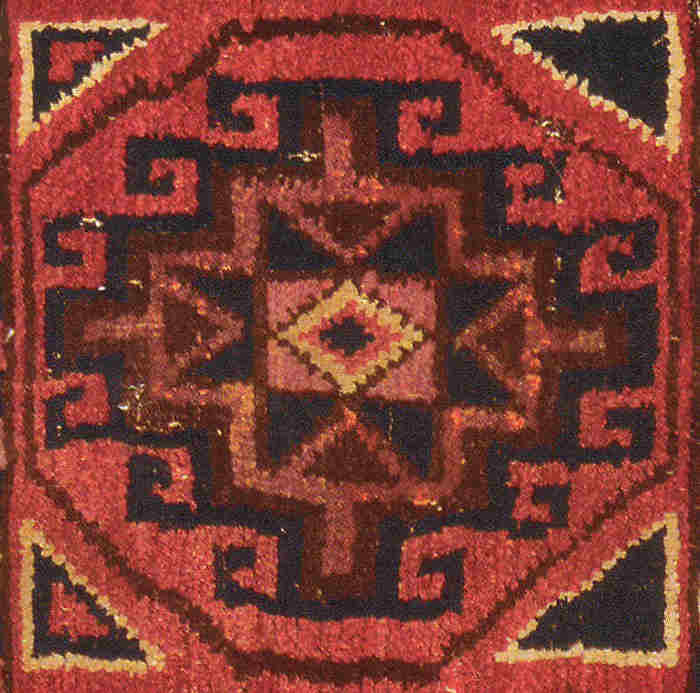 The secondary motif from a mid-19th century Shu'yit nag'ıs qarshın closely resembles a Turkmen chemche gul. Note the g'arg'a tuyaq crow's claw motif incorporated into the top and bottom of the motif. Interestingly Berdaq, the great Karakalpak bard and oral historian, wrote that the Shu'yit nag'ıs resembled the hub of a cart-wheel and originated from a clan of arba or cart makers. This is an amusing idea but seems to have no supporting evidence. 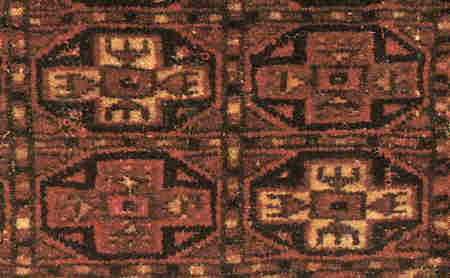 A 19th century Shu'yit nag'ıs qarshın with a single row of motifs. Note the g'arg'a tuyaq crow's claw motifs and the upper and lower Turkmen diamonds that do not appear in later weavings. A Shu'yit nag'ıs qarshın with a triple row of motifs. The secondary motifs are segiz mu'yiz. A double row is by far the most common. In all cases the Shu'yit nag'ıs motif is oriented vertically, unlike the horizontally orientated chuval gul. In some qarshıns the motif is elongated in the horizontal direction. There are many types of border pattern, the most common being piskekshe followed by barber's pole and qos mu'yiz. Single row qarshıns tend to have borders of Xorasanı mu'yiz. The fourth main qarshın pattern is the least common and accounts for just over 5% of qarshın patterns. Confusingly it has been given a variety of names, all based on the three-pronged or E-shaped motif included within the octagonal nag'ıs. A tikesh nag'ıs qarshın from Kegeyli. The Richardson Collection. 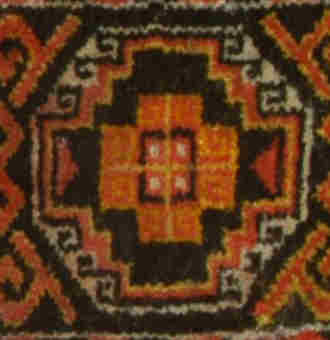 Zhdanko referred to the motif as taraq, or comb motif, in her 1958 article on "Karakalpak Ornamental Folk Art", mistakenly describing the item as an esikqas. The example she referred to came from the Kegeyli region and had the same design as a kergi from the same region that had been painted by Melkov. Zhdanko's earlier 1952 article also included an illustration of a tikesh nag'ıs qarshın but in this case no name was given for the design and no provenance given for the qarshın, this one also being described as an esikqas. Ludmilla Beresneva adopted the term iyt taban, or dog track motif, in 1993 for the one example in the Moscow collection, also incorrectly labelled as an esikqas. The motif concerned is not strictly taraq or iyt taban, the latter term only being used in Karakalpak embroidery, not carpetmaking. The motif actually resembles a bread-stamp and so a more accurate description would be tikesh nag'ıs. A Karakalpak tikesh nag'ıs with the three-pronged bread-stamp. To make matters worse, some Karakalpaks incorrectly associate this three-pronged motif with the Karakalpak shanıshqı or fish-spear, mainly used by the fisher folk living in the northern delta close to the Aral Sea. The shanıshqı fish-spear motif does occur in Karakalpak embroidery, where it has a much more fork-like shape. Because of this confusion, some people have linked this qarshın pattern with the Mu'yten tribe, who have the symbol of a shanıshqı as their tribal tamg'a or symbol. However there is no other evidence to support such an association. Tikesh qarshıns are relatively rare and so it is hard to assemble a statistically relevant sample with a documented history. 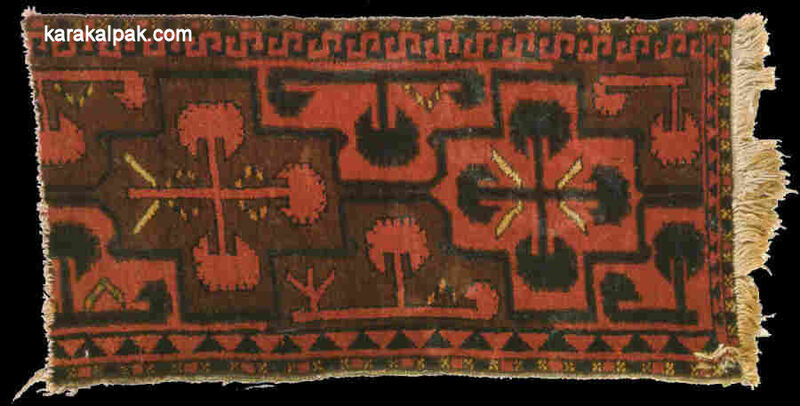 From the handful of examples with a known provenance, two were woven by women from the Beksıyıq clan of the Qıtay tribe (On To'rt Urıw), who mainly live at Beksıyıq awıl near Xalqabad, while a third originated from the Xalqabad region. Interestingly an all-pile kergi with the same pattern also comes from Xalqabad (Savitsky Museum item 25388). Finally the Zhdanko example referred to above came from the Kegeyli region, which of course includes Xalqabad, as does an example from our own collection. There is some limited evidence, therefore, that this pattern too is linked to a specific region and a specific Karakalpak clan belonging to the On To'rt Urıw arıs. Having said this we have also identified an example from Qon'ırat in the north-western part of the delta. The tikesh motif is the simplest of all the qarshın motifs. It consists of an octagon outlined in brown or blue on a red, reddish brown, or orange background. The octagon contains just five small rectangles arranged in the form of a cross. The central rectangle is red and contains a smaller brown rectangle while the four outer rectangles are white and contain a tikesh bread-stamp motif orientated with the three spikes pointing outwards. The cross is not arranged symmetrically but has the sides of the left and right rectangles overlapping both edges of the upper and lower rectangles. Again it is likely that this motif is of Turkmen rather than Karakalpak origin. Although it is not common it is found on both Yomut and Tekke mafrach. However unlike the Karakalpak motif, the Turkmen version always seems to be symmetrical. The octagonal motifs on a 19th century Tekke mafrach. Item KOB-210 from the Russian Ethnography Museum, Saint Petersburg. Tikesh nag'ıs qarshıns generally have three rows of 12, 13, or 14 motifs aligned within a rectangular grid. One example (Savitsky Museum item 2462) has 9 but it is only a fragment. Small coloured triangles fill the gaps in the four corners surrounding the octagonal motif. Although the use of diagonal colour symmetry does not occur within the individual motifs themselves it is incorporated into the overall pattern by alternating the colour of the outline of the octagonal motifs and/or the corner triangles. It is interesting that the same scheme applies in similarily patterned Turkmen weavings. The single side borders are narrow and usually contain rows of piskekshe motifs or, less commonly, a barber's pole design. One example has no side border. An old tikesh nag'ıs qarshın, probably dating from the second half of the 19th century. Item 4593 from the Karakalpak State Museum of Art named after Savitsky, No'kis. Like many of the older Karakalpak qarshıns it contains noticeable amounts of indigo-dyed pile, the tikesh motifs having alternate dark blue and light blue outlines. The main feature of this example is that it has two rows of 9 motifs arranged in a central field surrounded by a wide border. Instead of resembling a rectangular grid of identical motifs, the central field appears like an arrangement of primary octagonal motifs separated by secondary diamond-shaped motifs, the latter internally divided into quadrants by a cross. The border consists of a continuous row of hexagons containing crosses. Overall the pattern of this qarshın appears to be far closer to the layout of a Turkmen mafrach. 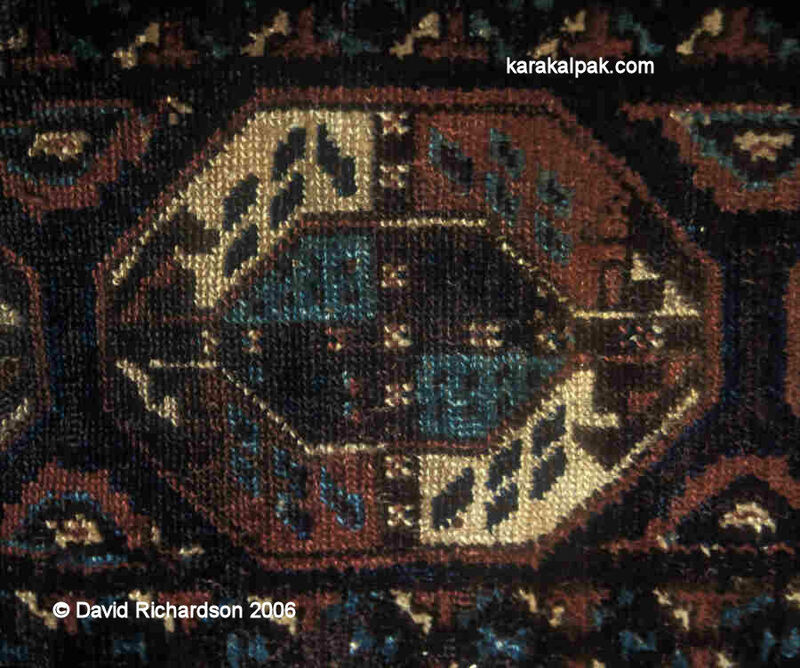 We can surmise that over time, Karakalpak weavers have simplified this Turkmen pattern, shrinking the borders and deconstructing the secondary motif into four small triangles within the corners of a rectangular lattice. The Karakalpak carpet collections in No'kis, Moscow and Saint Petersburg contain a few rare examples that have single rows of large octagonal motifs, yet do not conform to any of the previous four patterns. Most are clearly old and probably date from the second half of the 19th century or earlier. Ludmilla Beresneva's study implied that the two Moscow examples of this type must have been the prototype of the mainstream qarshın nag'ıs pattern and suggested that the differences between them indicated how the design had evolved and simplified with time. However the same museum collections contain examples of 19th century qarshın nag'ıs qarshıns that are remarkably similar to some of the later 20th century examples. Since both were being woven at approximately the same time we cannot assume that one is the forerunner of the other. It seems more likely that while some 19th century patterns have survived into the 20th century, others became obsolete. A 19th century qarshın with a rare octagonal motif. Item number 5752. The Karakalpak State Museum of Art named after Savitsky, No'kis. Let us call it the "Octagonal A" pattern. Other examples come from Moscow (1619 and 4311) and Saint Petersburg (7128-15). The two Moscow examples date from the 1850s and 1860s. 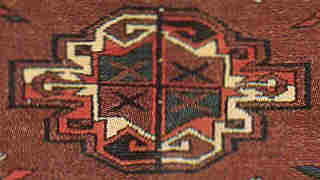 Example 1619 was woven by a woman from the Aq Man'g'ıt clan of the On To'rt Urıw while example 4311 was woven by a woman from the Uyg'ır clan of the Qon'ırat. This suggests the pattern was already widely distributed by the mid-19th century. Detail of the octagonal motif from qarshın number 7128-15. The Octagonal A pattern consists of a single row of 3, 4, 5, or 6 octagonal motifs, each containing a central hexagon. The entire octagonal motif is divided into quadrants by bold horizontal and vertical bars bearing their own pattern. The outer quadrants are coloured alternatively red and white, while (with one exception) the quadrants of the hexagon are coloured alternatively brown and blue. The outer part of each octagon contains a brown geometric figure with some resemblance to a bird's head along with five small parallelograms. This pattern is reflected in the two adjacent quadrants. Meanwhile the quadrant of each hexagon contains 6 or 7 smaller parallelograms, with the exception of the one example that lacks diagonal colour symmetry. All four qarshıns have wide side borders containing rows of diamonds alternating with I-shaped motifs. A qarshın with a rare octagonal motif, probably late 19th century. From the collection of the Russian Ethnography Museum, item number 7128-77. Another example from Saint Petersburg (7128-77) has some similarities but also a few important differences. We will call it the "Octagonal B" pattern. It is not clear whether it is a variant of the first pattern or a separate type. Its distinctive features are the inclusion of 7 rather than 5 parallelograms in the outer quadrants, the uniform black and red chequerboard colouring of the central hexagon, the pairs of triangles containing qos mu'yiz separating each pair of motifs, and the narrower side borders. These patterns are remarkably similar to a late 19th century Uzbek napramach woven on camel hair warps from Samarkand Oblast and held at the State Museum of Art in Tashkent. According to the late George O'Bannon, it was apparently referred to as a rare pattern from the "Karakalpak" people in Valentina Moshkova's personal notes. An Uzbek napramach from Samarkand with a "rare Karakalpak pattern". Uzbek State Museum of Art, Tashkent. The key question is whether this pattern was copied from Karakalpaks living in the Samarkand region or whether it was also a traditional Uzbek pattern? If it was copied it shows that the design must have been common to Karakalpak communities who may have been separated since at least the second half of the 18th century. If it was not copied it could date back to a pattern from the late 15th or the 16th century, at the time of the emergence of the Karakalpak and Uzbek confederations. The final qarshın type is typified by item 6588 from the Savitsky Museum, which unfortunately has no provenance and is mistakenly listed as an esikqas. We shall call this the "Octagonal C" pattern. A qarshın with another rare octagonal motif, probably late 19th century. Item 6588 (90cmx32cm) from the Karakalpak State Museum of Art named after Savitsky, No'kis. It has a row of 5 octagonal medallions containing a motif consisting of a large stepped cross sprouting 12 small hooks or horns. At its centre is a blue cross, each arm terminating with a rectangular pair of horns. This motif has similarities to both the kaikalak and the Memling gul and has been cumbersomely described as "the kaikalak variant of the Memling gul". It is not unique to the Karakalpaks, being found on Uzbek napramach, Lakai-Uzbek mapramach, Kyrgyz chavadan, and even Shasavan mafrach, either alone or within an octagon. A Lakai-Uzbek mapramach with a Memling gul pattern. Note that the motif has a different orientation to that in the Karakalpak qarshın. The so-called kaikalak variant of the Memling gul. From an early 20th century Kyrgyz chavadan. The Octagonal C qarshın has wide side borders with two rows of motifs, the outermost containing a row of alternating small diamonds and I-shaped motifs. The qarshın contains small details woven in silk. 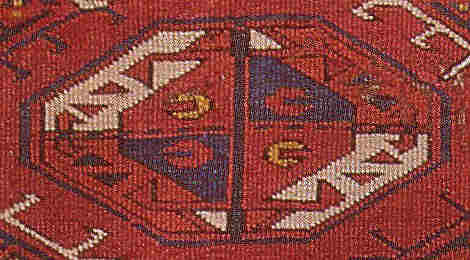 A qarshın with the Octagonal C motif from Bozataw woven in the 1910s. Though rare, this pattern has survived into the 20th century as evidenced by the almost identical example in our own collection, woven in Bozataw between 1910 and 1920 and incorporating synthetic dyes. Anna Morazova reported that in the past Karakalpaks from other parts of Uzbekistan used a bog'jama, a box-like storage bag very similar to the Aral Karakalpak qarshın. It was a pileless qarshın woven with a warp of strong goat's wool (qılshıq) and a weft of soft goat's wool (tu'bit). The word seems to be of Uzbek origin and means a big cloth. The Uzbek bugdzhoma is a large square-shaped flat-woven textile used for wrapping blankets or clothing. The cloth is laid open oriented like a diamond and the blankets are arranged in a stack in the middle. They are then wrapped like a parcel, the corners of the cloth being folded over to envelop the contents in such a way that the corner embellished with fringes decorates the top. The folded bugdzhoma has a very qarshın-like appearance. The Aral Karakalpaks used the same Uzbek word to describe a flat storage bag made of cotton and with its face decorated with appliqué. See Karakalpak Kergis. 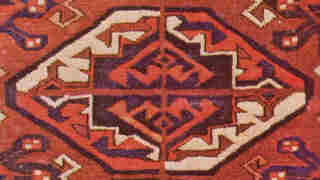 Many Kyrgyz rugs contain a motif frequently described as the Karakalpak motif or pattern (karakalpak kochot, karakalpak nuska or potnos kochot). It basically consists of a cross, the four ends of which terminate in a pair of horns. Frequently it has a diamond centre. In some renditions the horns almost look mushroom-shaped. In others the ends of the cross terminate with diamonds instead of horns. 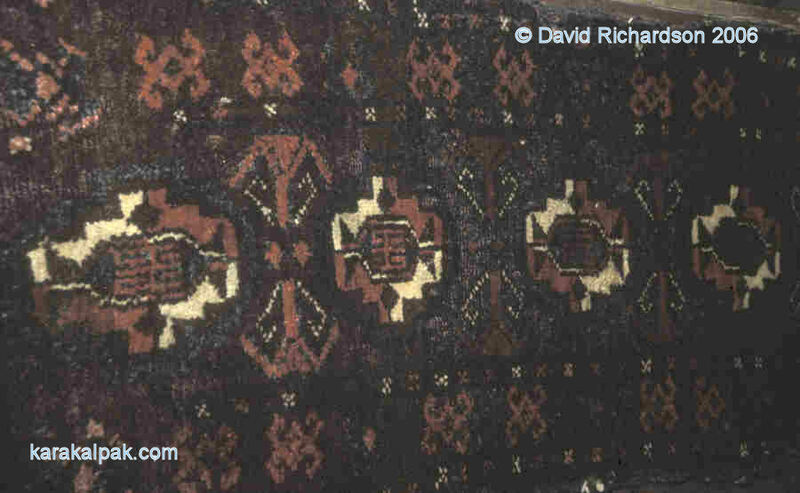 This link with the Karakalpaks intrigued George O'Bannon, especially in the light of the misattribution of Uzbek-Turkmen rugs from Nurata (see The Karakalpak Question in The Kyrgyz Carpet, Volume 1). However O'Bannon was unaware of the existence of Karakalpak communities throughout the Ferghana Valley and in Samarkand and so the issue remained a mystery to him. As with the Karakalpaks, it was not traditional for the Kyrgyz to weave all-pile rugs or carpets. It is believed that Kyrgyz carpet weaving was borrowed from the Uzbeks and eastern Turkmen and that many motifs were copied from neighbouring Uzbeks and Karakalpaks. 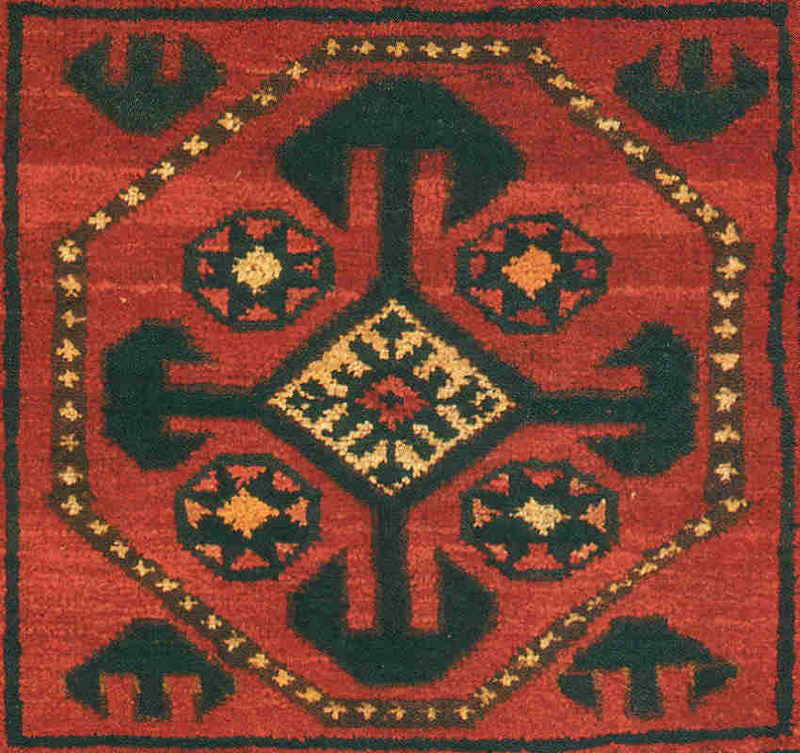 Although the motif of a cross terminating with four pairs of horns occurs in the embroidery of the Karakalpaks of the Aral Delta (especially on the top of skull caps), it does not occur in their carpet wares. 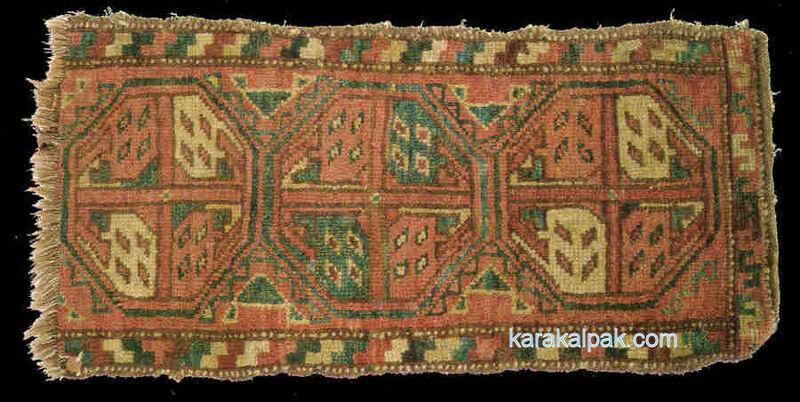 Yet the karakalpak motif implies that the Ferghana Karakalpaks once wove small carpet items, perhaps qarshıns, containing this motif. 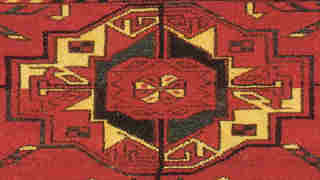 An octagonal karakalpak motif on a 20th century Kyrgyz weaving. In the early 1990s Sha'rigu'l Payzullaeva, then a curator at the Regional Studies Museum in No'kis, was tasked with researching the cultures of the Karakalpaks living beyond Karakalpakstan. She found that communities in the Ferghana Valley, Samarkand, and Nurata had long ago adopted local Uzbek culture and now spoke local Uzbek dialects and wore Uzbek costume. Yet they still regarded themselves as Karakalpak and some could understand a few Karakalpak words. 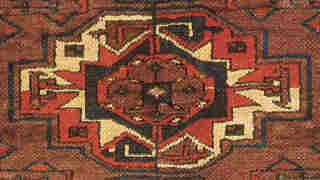 The style of their yurts was also distinctly Karakalpak and some of them possessed a few traditional carpet weavings. The latter were not the same as those found in the Aral Delta but did have some recognizable Karakalpak characteristics. Sha'rigu'l photographed one carpet owned by the Xojanqulov family from Chinabad village, Andijan viloyati. Its main feature was an unmistakeable karakalpak motif � a cross with a diamond at its centre and crosspieces terminating with pairs of rectangular-shaped horns. 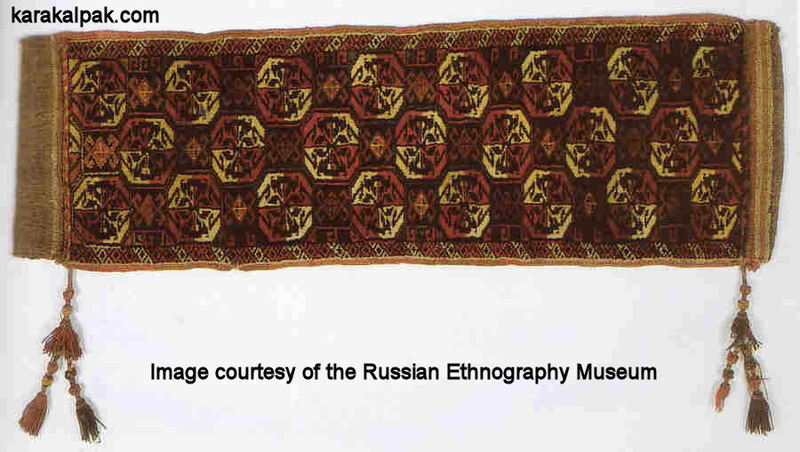 It provides clear evidence that the Ferghana Karakalpaks did have their own carpet motif, one that has yet to be discovered in Karakalpak carpets from the Aral Delta. The existence of this motif might finally help us to explain the confusion created by the Bogolyubov rug from Nurata that was mistakenly labelled "Karakalpak". Perhaps the 19th century Samarkand rug dealers referred to Nurata rugs as Karakalpak not because they believed they were woven by Karakalpaks but because the central cross in the kalkan nuska gul had similarities to the karakalpak motif. A Kyrgyz chavadan dating from 1891 with the karakalpak nuska pattern. State Museum of Fine Art, Tashkent. Indeed does the kalkan nuska show us a possible link between the karakalpak motif of Ferghana and the octagonal qarshın nag'ıs of the Aral Delta? After all the latter is essentially an octagon containing a cross with a diamond at its centre but lacking any terminal horns. Some support for this idea is provided by a number of southern Kyrgyz chavadans that contain an octagonal motif described as the qarchin or kalkan nuska. It is identical to the karakalpak motif. Antipina believed it was copied from local Uzbeks or Karakalpaks. The wide distribution of qarshın-like bags among the Karakalpaks, Uzbeks, Qazaqs, and Kyrgyz, coupled with their general absence among the Turkmen, suggests that their origin at least dates back to the early Qipchaqs prior to their expansion from southern Siberia into Central Asia. Karakalpak all-pile qarshın aldıs tend to be longer and narrower than the faces found on most Uzbek, Qazaq, and Kyrgyz storage bags. The one exception is the ten-tyuk found among the Qazaqs of the Lesser Horde living in the lower Syr Darya and the Aral Delta. The development of long and thin qarshın-type bags may therefore have been a special feature of the Qazaqs and Karakalpaks living in the region of the Aral Sea. The name ten-tyuk suggests these bags were originally always made as a pair for easy transport by pack animal, reinforcing our belief in their nomadic origin. Having said this we have never seen a matching pair of 19th or 20th century Karakalpak qarshıns. In 1958 Tatyana Zhdanko supposed that in the past the pattern of Karakalpak qarshıns was different for each tribe, just as it seemed to be for the Turkmen. Fifty years on it is still hard to say whether this was ever the case. Because the history of many qarshıns in museum and private collections has been lost it is hard to build up a comprehensive data base from which to analyse the geographic and tribal distribution of patterns. Nevertheless from the limited information accumulated by the authors it seems that qarshın designs were probably not tribe-specific, at least not from the middle of the 19th century onwards. Although the Shu'yit nag'ıs and tikesh nag'ıs patterns are linked to specific regions and clans these seem to be exceptions. They seem to have arisen as a result of the adoption of foreign patterns, introduced into specific clans due to local circumstances, and are not examples of traditional tribe-specific patterns. The Qon'ırat arıs certainly had two basic patterns, both based on an octagonal motif � the tay tuyaq and the qarshın nag'ıs � the latter existing in two variants. Although both have their stronghold in the northern parts of the Aral Delta they can also be found among some of the On To'rt Urıw clans further south. We have also seen that at least three other octagonal patterns existed among the Qon'ırat and the On To'rt Urıw in the past but became rare or extinct during the early part of the 20th century. By contrast, the Shu'yit nag'ıs and tikesh nag'ıs patterns appear to be associated with specific regions and small numbers of clans belonging to the On To'rt Urıw arıs. Over time these patterns seem to have migrated into certain Qon'ırat clans. From those examples where the clan of the weaver was recorded, we know that these are definitely Karakalpak weavings and this is supported by the fact that the overwhelming majority have a typical Karakalpak structure. Yet older examples of both patterns have a remarkable similarity to Turkmen designs suggesting that they may have originally been introduced into specific Karakalpak clans during the 18th or 19th centuries from neighbouring Turkmen tribes. Not only the northern Yomut but various Chodor, Emreli, Goklen, and Igdir tribes occupied the fringes of the Qara Qum along the western edge of the Aral Delta at that time. For example, Girshfeld and Galkin reported in 1903 that "...in the Khiva Khanate one can find Turkmen clans who have settled a long time ago, for example the Emreli and Qaradashly living in Il'yali district." We know that the Karakalpaks remained vulnerable to Turkmen raiding parties up to the 1920s and it was common for Karakalpak children and young women to be kidnapped. However a young Karakalpak bride in a Turkmen family would not only be taught to weave Turkmen designs but to make Turkmen tent bags according to Turkmen methods. This might have been a way for Karakalpak designs to be introduced into Turkmen weavings but not for Turkmen designs to be introduced into Karakalpak qarshıns. Not all Karakalpak and Turkmen communities were at loggerheads. In certain parts of the delta they lived closely together in peace. In certain cases there was even intermarriage, such as with the Chodor. The 1962 Qazaq ethnographic expedition to the Aral Delta identified communities where Qazaqs and Turkmen had lived together for generations, one being located in the Keltemina'r region. Shalekenov noted that they discovered the Qazaq women had been taught to weave carpets by Turkmen forewomen. It seems likely that some Karakalpak weavers also learnt to copy Turkmen designs from their local friends and neighbours, or simply from the Turkmen weavings themselves. In doing this they maintained the use of traditional Karakalpak materials (such as goat hair rather than sheep's wool for warps) and employed Karakalpak looms and weaving methods. Morozova refers to an earlier observation by G. Shultz concerning the abundance of carpet items made by the Yomuts found in Karakalpak households. Prior to the Soviet era, communications within the delta were extremely limited. Rossikova observed the almost complete absence of roads when she visited the southern part of the Amu Darya Division in 1901. Most families spent their lives within the environs of their own village and marriage tended to take place between clans within the same local region. For example the neighbouring Ashamaylı and Qıyat tended to marry between each other as did the neighbouring Qoldawlı and Balg'alı. It was therefore possible for local patterns to be sustained in a geographical region. The 1920s ushered in a period of rapid change and increased mobility, and it became possible for young men and women from across the delta to meet and marry. Patterns from one region could now be easily transferred to other regions. It is therefore surprising given the complexity of Karakalpak tribal structure that there are no more than just a handful of genuinely traditional qarshın patterns. Indeed perhaps we should even question the origin of the tay tuyaq pattern since we have seen how a Turkmen chemche gul has been transformed into a Karakalpak segiz mu'yiz motif in the Shu'yit nag'ıs qarshın. Is it possible that the same transformation took place to create the tay tuyaq qarshın, albeit at an earlier stage? Is the tay tuyaq nothing more than a much simplified Turkmen chuval bag face? 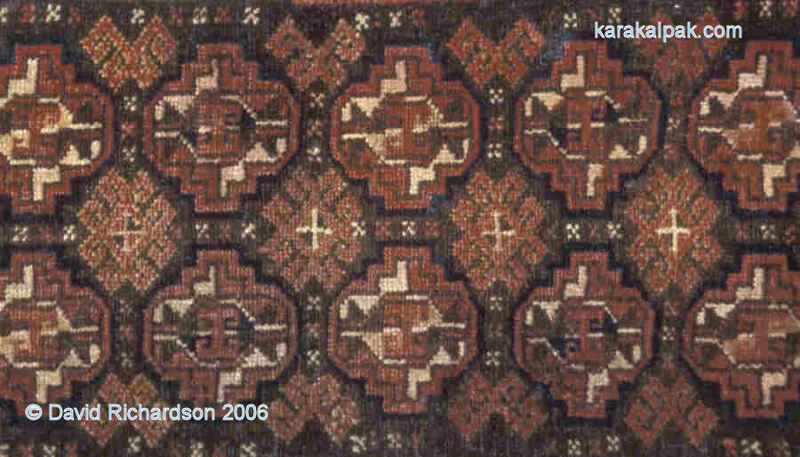 The 90 degree rotation of the motif suggests it was transposed from the Turkmen to the Karakalpak loom. Further support for this idea comes from the fact that this pattern seems to be unique to the Karakalpaks of the Aral Delta, suggesting that it may have evolved during or sometime after their settlement in this region. The puzzle is why the tay tuyaq motif is octagonal and not chuval gul-shaped, since the Shu'yit nag'ıs qarshın shows that Karakalpak weavers were quite capable of reproducing the correct chuval gul shape? One possiblity might be that it did not originate from the chuval gul as such, but from the octagonal form of that motif that some have linked with the Yomut. 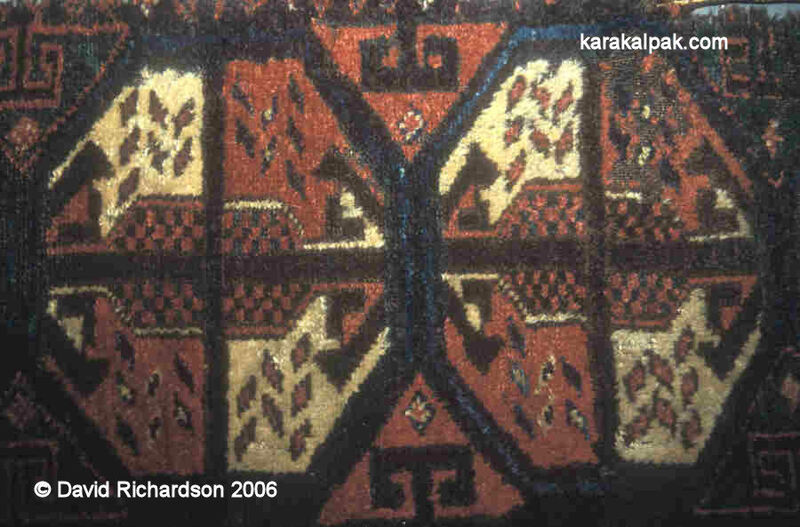 Certain authors have suggested that Karakalpak carpet motifs and weaving structures might be very ancient. Ludmilla Beresneva wrote: "The Karakalpaks as well as the Nurata Turkmen are genetically related to the Oghuz, who migrated westwards from the Syr Darya region in the 9th � 10th centuries. ... It can be said that sometimes the Turkic-speaking people were in contact, including Karakalpaks and Turkmen. If this is so, then the Karakalpak karshin gol and the tay tuyaq patterns are some of the most ancient patterns in Central Asia." �	the use of the symmetrical knot combined with irregular knotting, one weft shoot, the plentiful use of camel hair, etc. �	the fact that part of the initial population did not ever leave the territory of the Amu Darya � Syr Darya delta, and was therefore able to avoid any influences from other carpet weaving traditions of Northern Eurasia. �	the use of "small chuval gols", a motif known to all carpet-weaving peoples of Central Asia and the Caucasus, whose widespread use suggests that its roots are deeply embedded throughout the centuries and possibly millennia. Our own analysis suggests that the Karakalpak chuval-like Shu'yit nag'ıs and the tikesh nag'ıs patterns are not ancient at all but are possibly relatively recent developments. Beresneva fundamentally misunderstood Karakalpak tribal history. The Karakalpak confederation was formed over half a millennium later than the arrival of the Oghuz in the lower Syr Darya. The Karakalpaks are genetically quite different from the Turkmen, being more closely related to the Khorezmian Uzbeks, and to a lesser extent the Qazaqs. Like the Uzbeks they are a highly heterogeneous people, assembled from many tribal groups and being strongly influenced by the culture of the Qipchaqs. The Karakalpaks initially lived in isolation from the Turkmen and only began to move into the Aral Delta in numbers in the second half of the 18th century. Their forced settlement mainly took place in the first quarter of the 19th century. By the middle of the 19th century therefore Karakalpaks had only been in contact with the neighbouring Turkmen for a century at the most. If our suspicions about the tay tuyaq pattern are correct then this too may also be a relatively recent pattern. This would be a remarkable conclusion, since our first impression of the tay tuyaq pattern in 1996 was of an apparently primitive and therefore presumably ancient motif. This only leaves us with the qarshın nag'ıs and the other more rare octagonal patterns, some of which seem to share certain common design elements. It seems that these represent the truly traditional Karakalpak qarshıns. While bearing little resemblance to any known Turkmen motif, we have seen that patterns like the qarshın nag'ıs occur on many Uzbek napramach. Uzbek expressions of this pattern tend to be more varied and less stereotyped, possibly because the Uzbeks abandoned their yurt-based culture well before the Karakalpaks. Zadykhina found that in the second half of the 19th century most Uzbeks in southern Khorezm had adopted clay houses, while yurts were only maintained as a special feature by Uzbeks in the Aral Delta. According to Moshkova, the weaving of napramach and other yurt items throughout the Uzbek SSR had dropped off sharply by the early 20th century at a time when Karakalpak weaving was still booming. It is of course possible that the Samarkand example referred to by Moshkova was copied from local Karakalpaks. At the same time the general format involving a single row of octagonal motifs within an outer border occurs over and over again in both Uzbek napramach and in Kyrgyz chavadans. It is possible therefore that some elements of qarshın nag'ıs and other single row octagonal qarshıns might have their origins in Qipchaq nomadic culture. Whether the specific patterns we see in 19th century Karakalpak qarshıns are equally as old is impossible to say, we simply lack any empirical evidence. We do know that unlike weaving structures, carpet designs are fickle and are easily copied or changed. There is some evidence to suggest that the various Turkmen patterns evolved through a cladistical process, being modified over time without any external influence as tribal groups separated and developed in different directions. The similarities between some of the Karakalpak octagonal qarshın patterns might point towards a similar process of past evolution. However in the absence of any significant sample of 18th or early 19th century Karakalpak weavings it is impossible to make a judgement. When Gladyshev and Muravin visited the Aral region in 1741 the Karakalpak and the Qazaq confederations had already been fragmented for 18 years as a result of devastating Jungar (Kalmuk) raids. Muravin reported very few differences between the Karakalpaks, the Qazaqs of the Lesser Horde, the Aral Uzbeks, and the Khivan Uzbeks, save for the fact that the Khivans were generally wealthier. Their costumes were all remarkably similar. Unfortunately Muravin did not provide details of their yurts or carpet weaving. However the Karakalpaks were primarily cattle-breeders, the Qazaqs were nomadic sheep-breeders migrating enormous distances between the Syr Darya and the rivers Or, Irghiz, Tobol, Turgay, and Ishim, while the Uzbeks were more settled and agriculturally dependant. These differences alone must have been the cause of some distinction between their yurts and related carpet weavings. Even before the Jungar raids, the Karakalpaks had been drifting apart geographically and possibly culturally; the "upper" Karakalpaks living in the Sighnaq-Turkestan region and the "lower" Karakalpaks in the lower Syr Darya. Gladyshev and Muravin only visited the latter. The subsequent migration of different Karakalpak groups into the Aral Delta, the Ferghana Valley, and the Zeravshan oasis must have led to further cultural diversification. The Qon'ırat Karakalpaks were cattle-breeders and while the men tended their herds the women were free to engage in weaving and other textile crafts. The On To'rt Urıw Karakalpaks were mainly farmers and women had to help the men in the fields, leaving less time for craft work. Within the Aral Delta, the Shu'llik Qon'ırat lived on the coast and islands of the Aral Sea and were fairly isolated. The Jawıng'ır Qon'ırat lived further south, especially in the Shomanay region, not far from the Turkmen territories. The On To'rt Urıw lived in more compact groups along the Kegeyli channel, where they came under the influence of both the Turkmen and the Khivan Uzbeks. Karakalpaks in regions such as Samarkand and Ferghana came under different local influences and the presence of Tajiks and Kyrgyz. As both Tolstova and Payzullaeva clearly discovered, by the middle of the 20th century the more isolated Karakalpak groups in the Ferghana and Zeravshan valleys had lost most of their original culture and had long ago blended in with the surrounding Uzbeks. It cannot be proved but we suspect that the qarshın nag'ıs and some of the other octagonal qarshın motifs crystallized in the 18th and early 19th centuries as the Karakalpaks migrated down the Jan'a Darya into the Aral Delta. The relationship between the octagonal qarshın patterns of the Aral Delta and the karakalpak pattern from the Ferghana Valley is perhaps the best indicator that we have concerning the evolution of Karakalpak qarshın designs. The underlying common feature is a cross with a diamond at its centre within an octagonal surround. In some variants the central diamond expands into an octagon. In others the terminal horns transform into hooks, mushrooms, or diamonds. In the karakalpak kochot the external octagon is frequently discarded. At the same time a few qarshın patterns may have more ancient traditions. For example the Memling-like octagonal design could be very old and there is some evidence to suggest another octagonal pattern at least dates back to the second half of the 18th century when the last wave of Karakalpaks moved from the Syr Darya into the Zeravshan valley. Of course many of the component parts of these patterns could go further back into antiquity. To take the matter to the extreme, the cross within a diamond lozenge is claimed by some ethnographers to be a fertility symbol originating from the Upper Palaeolithic. Tatyana Zhdanko long ago pointed out the remarkable similarity between Karakalpak border patterns and those found on Andronovo ceramics dating from the late 3rd millennium BC. The Aryan and other migrations must have spread such designs far and wide across Eurasia. It is no surprise to see some of them reappear in later Saka and Sarmatian cultures and even later among the Turks. The migratory routes of these motifs may be hard to identify but the coincidence of their repeated occurrence is too frequent to put down to chance. We are continually amazed by the appearance of typical Turkic and sometimes specifically Karakalpak motifs in for example East European, Tibetan, Bhutanese, Burmese, Laotian, Thai, Vietnamese, and Indonesian textiles. The many disparate tribal factions who found themselves swept up into the Karakalpak confederation were the undoubted inheritors of a wide repertoire of design motifs from across Eurasia. The structure of Karakalpak qarshıns is primarily a reflection of traditional Karakalpak lifestyle. 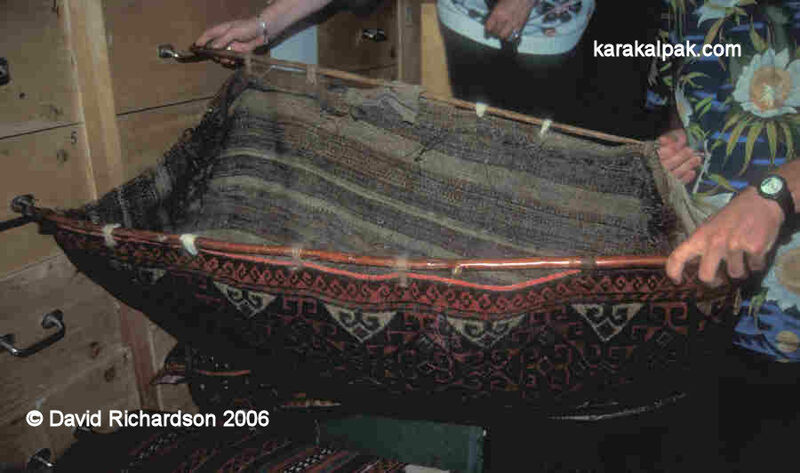 Karakalpak weavings are generally simple and uncomplicated, utilizing readily available fibres such as goat hair and cotton. Camel wool too was locally available but good quality sheep's wool was precious, bartered for from Qazaq nomads and reserved for the highest status items. The major weaving task for any Karakalpak girl was to make a complete set of tent bands for the yurt. The Karakalpak o'rmek loom was primitive and primarily designed for making tent bands, no different from the o'rmek loom used by Qazaq and Kyrgyz nomads. Of the tent bands required, the weaving of the aq basqur and the two sets of janbaw was probably the most onerous. In these the use of the sheep's wool was optimized, being used solely for all-pile motifs, the plain cotton providing the ground. The insertion of a raised pile on such warp-faced tent bands with closely spaced warps is technically only possible using symmetrical knotting. Karakalpak girls only ever wove two small all-pile carpet items in their whole lives � a qarshın and an esikqas. They too were woven on the same o'rmek loom and not surprisingly they were no wider than a tent band. As with the combination technique tent bands, the pile was symmetrically knotted. This limited experience in pile weaving meant that the Karakalpaks were never able to raise all-pile carpet weaving into a refined art in the way that was accomplished by the neighbouring Turkmen. Having said this it is clear from the fabulous colours of the older qarshıns that the Karakalpaks had long ago mastered the art of dyeing. From our researches it is clear that the Karakalpaks utilized many local plants and other materials in their dye recipes, the details of which have now been completely lost. Some of these dyes were undoubtedly unique to the Aral region and its endemic tugay ecosystem. We also know that Khorezm was an important area for the harvesting of wild madder and that indigo was imported into the region from Afghanistan and Persia in significant quantities. However after annexation in 1873, Russian merchants pressurized the Turkestan authorities to choke off imports from British India, while Russian-made aniline dyes increasingly became available, undermining the traditional natural dyeing culture. It was probably the increasing availability of chemical dyes that had the most adverse effect on the quality of 20th century Karakalpak qarshıns. Qarshıns were still being woven in the 1930s but they seem to have died out by the 1940s. Zhdanko's ethnographic team began their studies on the material culture of the Karakalpaks and other peoples of the Aral Delta in 1945. In their progress report for the 1954-56 period they commented that they had yet to record the weaving of all-pile carpets or of combination technique aq basqurs and janbaw. Though not always in good condition many old Karakalpak qarshıns remain powerful weavings, with uncluttered designs and fabulous colouring. The Karakalpaks were undoubtely poor and oppressed and they had only primitive equipment and limited access to imported materials. Despite these handicaps they fully exploited the resources of the Aral Delta and made the most of what they had. The most interesting conclusion from this analysis is the past fluidity of Karakalpak design. What initially appear to be a fixed set of stereotyped patterns are in reality not fixed at all. Although it is still difficult to map the evolution of all the changes over time, it is clear that the Karakalpaks progressively reinterpreted their own traditional qarshın patterns. At the same time they had no aversion to incorporating foreign elements into their weavings and making them their own. We consider some of their creations to be masterpieces of Aral Delta folk art. There is only one museum in the world that has a comprehensive selection of qarshıns on public display - the Karakalpak State Museum of Art named after Igor Savitsky, located in the centre of No'kis, the capital of Karakalpakstan. No'kis is very easy to visit on a day trip by road from Khiva. The Museum is friendly and several staff speak English. Other examples used to be on display in the former Karakalpak Regional Studies Museum which unfortunately closed in 2010. There are plans for the exhibits to be rehoused in a new city centre location in 2012. For detailed information on visiting these museums see our Sightseeing page. Both the Russian Ethnography Museum in Saint Petersburg and the State Museum of Oriental Art in Moscow have good collections, but very few Karakalpak items are on public display. Items held in the reserve funds of both museums can be seen by prior arrangement. The State Museum of History in Tashkent also has one or two qarshıns in its reserve fund, collected by Melkov in 1929. Andrews, P. A., The Türkmen Tent, in Mackie and Thompson (see below), pages 41 to 59, 1980. Antipina, K. I., The Kyrgyz Carpet, Volume I, edited by O'Bannon and Amanova, published by George O'Bannon, Tucson, 2000. Beresneva, L. G., Karakalpak Carpet Wares [in Russian], The State Oriental Museum, Moscow, 1994. Beresneva, L. G., and Teselkin, A. S., The Karakalpak Rug Collection in the Museum of Oriental Art, Moscow, Oriental Rug Review, Volume XVI, Number 1, October/November 1995. Beresneva, L. G., The Kyrgyz Carpet, Volume II, edited by O'Bannon and Amanova, published by George O'Bannon, Tucson, 2000. Mackie, L. W., and Thompson, J., Turkmen Tribal Carpets and Traditions, The Textile Museum, Washington DC, 1980. Moshkova, V. G., Carpets of the People of Central Asia [in Russian], Published by Fan, Uzbek SSR, Tashkent, 1970. Moshkova, V. G., Carpets of the People of Central Asia, edited and translated by O'Bannon and Amanova, Published by George O'Bannon, Tucson, 1996. Payzullaeva, Sh., Numerous Karakalpaks, Many of Them! [in Karakalpak], Karakalpakstan Publishing, No'kis, 1995. Pinner, R., The Rickmers Collection, Turkoman Rugs in the Ethnographic Museum Berlin, Museum fur Volkerkunde, Berlin, 1993. Rossikova, A. E., On the Amu Darya from Petro-Aleksandrov to Nukus, Russian Bulletin, Number 8, pages 562 to 588, 1902. Tehrani, J., and Collard, M., Investigating cultural evolution through biological phylogenetic analyses of Turkmen textiles, Journal of Anthropological Archaeology, Volume 21, pages 443 to 463, 2002. Tolstova, L. S., Karakalpaks of the Ferghana Valley [in Russian], KKGIZ, No'kis, 1959. Tsareva, E., Rugs and Carpets from Central Asia. The Russian Collections, Penguin Books, Harmondsworth, 1984. Tsareva, E., Yurt interior. Wall bags and other textile containers, from Muziek voor de ogen, pages 105 to 143, Luc Denis, Antwerp, 1997. Tsareva, E., Pile Weaves of Uzbekistan, A World of Carpets and Textiles, edited by Murray Eiland Jr, pages 223 to 236, Published by the International Conference on Oriental Carpets, Washington DC, 2003. Zadykhina, K. L., Development of the Dwelling, from the Uzbeks of the Amu Darya Delta [in Russian], pages 353 to 359, Works of the Khorezm Archaeological and Ethnographic Expedition, 1945-1948, Volume 1, Academy of Sciences of the USSR, Moscow, 1952. Zhdanko, T. A., Work of the Karakalpak Ethnographical Force in 1956, Field Studies of the Khorezm Expedition in 1954 � 1956, Publishing House of the Academy of Sciences of the USSR, Moscow, 1959. Zhdanko, T. A., and Esbergenov, X., Ethnography of the Karakalpaks [in Russian], Fan Publishing, No'kis, 1980. This page was first published on 7 July 2006. It was last updated on 24 February 2012.